I am so excited to be part of the Ultimate Blog Party 2012! On my blog you will find cute and healthy school lunches that I make for my kids and from time to time a favorite recipe! I hope you come to stay! I am a busy Mom or four and a proud Military Wife. I love cooking and making healthy and yummy food for my family. Hello Nina!!! It's nice to meet you!!! Hi Nina~ I am Teri from The Freshman Cook. I am a new follower, stopping by from UBP. Love your blog! So glad to meet you! We were a military family too! Army :> Can't wait to read more of your blog. Would love for you to stop by and say hi. Hello! Dropping by to say hello from A Well-Seasoned Life. Thanks for stopping by my blog via UBP 12 and saying hello! So excited to find new ideas for adorable lunches for my kiddos:) Happy to have found you. HI! Stopping by from All Things Mamma for UBP 12! Love, love, LOVE your site! 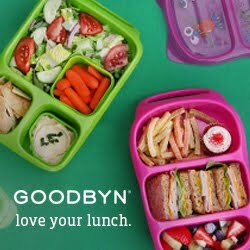 My daughter loves healthy, fun lunches and I can't wait to try some of your ideas! I already Pinned one too! Your lunches are SO cute!! I am excited to try and make my lunches fun. Adding you to my "to read" list! Thanks!! I am stopping by from the UBP! I enjoyed your post from breakfast this morning very sweet thoughts! I am following you now and look forward to coming back and seeing what you're up too! Stop by and say hello if you have time.